Just recently a friend asked me to recommend a pub with good food near Ipswich. I happily reeled off a number of favourite options that fitted the bill (incidentally you’ll find most of them listed in our Food Gallery pages). Among my recommendations was the Fountain, just a couple of miles out of town in the village of Tuddenham St Martin and it struck me that the request had been almost word for word that of the signage that adorns the front of this characterful bistro style restaurant - ‘a pub with great food’. A bold move, one might think, to be so blatantly confident about the quality of one’s wares but I’m more of the mind that if you can’t be sure that you’ll always ‘deliver’ you probably shouldn’t be in business. Of course proprietors Scott Davidson and Charles Lewis know a thing or two about running successful restaurants. They’ve been pleasing punters at the Fountain for eight years now but spent the previous eight years at what, back then, was one of my (and my husband’s) very favourite restaurants – Scott’s – which was in Ipswich town centre. It’s a confident stance too when a kitchen if in full view of the paying public. 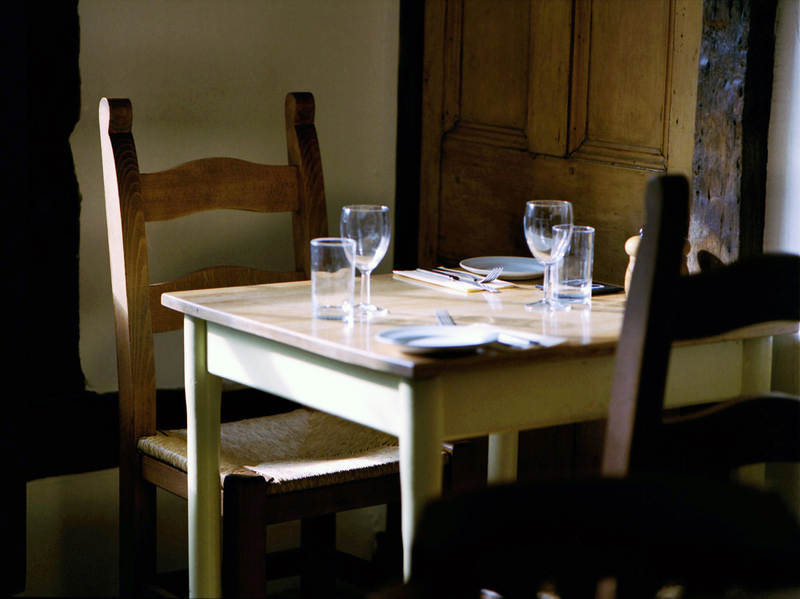 Although the majority of the tables at the Fountain are set out in the cosy and suitably rustic restaurant there are a few tables near the bar where Head Chef, Matt McCarthy and his team can be seen in full swing. We had booked our table for 6.30pm and by 7pm the restaurant was steadily filling with barely a table available an hour later and it’s clear that the opportunity to enjoy the formalities of a restaurant experience but in the relaxed yet mature atmosphere of a pub is a combination that keeps happy customers coming back time and time again. Of course good service will always keep clients loyal and Charles & Scott have a team that make for an effortless visit. With our drinks order taken on arrival we settled down with the menu and a wry smile grew across my husband’s face. Back in the ‘Scott’s’ days it was one of the first restaurants to reinstate the lamb shank as a restaurant winter staple. As far as Mr R is concerned there’s only one way lamb shank should be eaten and that’s with it virtually falling from the bone and he knew he wouldn’t be disappointed. Instead of the traditional red wine gravy and winter vegetables the lamb was to be served Moroccan style on roasted vegetable giant couscous so all that remained was to choose a starter that would complement. Twice baked Cromer crab soufflé with crayfish sauce was selected and both dishes were winners. The light soufflé was packed with rich seafood flavours and paired beautifully with the hearty spiced lamb. My choices took a slightly more circuitous route. I’d overheard the reassurances of one of the waiting staff to another table of guests that the Scotch egg starter was indeed vegetarian as the usual sausage outer casing had been replaced with a cheesey crumb. Well I was intrigued. Despite having been vegetarian for some time one of my nieces was recently wooed back to the world of meat eating by the lure of a humble Scotch egg and to discover a version that might fulfil her palate more pleasingly was an opportunity not to be missed. Served with homemade coleslaw and toast soldiers the sausage wasn’t missed for a moment and in fact I think I may have preferred this new twist to the traditional as I often find the meat and egg combination too filling, unless served as a main course. I chose to follow with one of the fish dishes from the Specials board. My roasted whole Seabass with leek and fennel stuffing was accompanied by sweet potato fries – a rather sophisticated take on fish and chips suppose. The robust flavours of the stuffing were great bedfellows and my fish perfectly cooked, flaking from the bone with ease. I noticed that Blakeney mussels were also on the board, a mental note for another time as they were available as either a starter/ light lunch or main course and frankly a favourite for us any time of day! Although I’m determined to lose a few pounds before the better weather arrives I wasn’t going to pass up the baked dark chocolate fondant with vanilla ice cream for dessert. Adrian decided that if he ordered a couple of favourite ice cream flavours for his pud (ginger and chocolate) he might share with me and pinch a little from my plate to go with them, which of course he did. How the waiting staff can spend a service inhaling the chocolatey aroma that rises from this heavenly dish without diverting to the staff room to indulge in it themselves I don’t know because one whiff and I wouldn’t be able to resist. There’s a weight and a richness to the flavour that balances with the light fondant and is nothing less than divine. Coffees perfectly rounded off our evening as our thoughts turned to the not far off ‘turning forward’ of the clocks. There’s a large covered patio at the Fountain and a good sized garden beyond and with plenty of patio heaters in this sheltered spot it won’t be too long before the weather is fine enough to enjoy the outside space again as the evenings grow lighter as well as an al fresco lunch, or two!